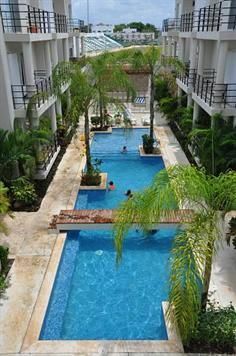 Life's a Beach | Expat Life in Playa del Carmen : 3 Bedroom Playa del Carmen Penthouse - Price REDUCED! Reduced to $220,000 usd this sleek, modern 3 bedroom/3 bath Penthouse in downtown Playa del Carmen. Located in a popular, upscale north end neighborhood, this sleek penthouse has been cleverly converted from a two bedroom into a three bedroom without sacrificing any interior space. A third bedroom had been added utilizing a potion of the large rooftop solarium, overlooking the pool and lounging areas below. This condo has been set up for fun and is being sold with all furnishings and extras! It has a small pool table, dart board, boxing bag and gloves, golf clubs, and tennis rackets. There is even a large jacuzzi on the rooftop terrace, everything you could possible want to enjoy a fabulous family vacation! The third bedroom is suitable for 1 person and 1 child to sleep, while each of the other 2 bedrooms has a queen bed. Centrally located, the beach is just a 7 minute walk, and 5th Avenue is even closer with hundreds of shops and restaurants. Enjoy walking, running, basketball or tennis as the public stadium, track, and park is located just a block away. Completed in 2007, this secure complex has become very popular with vacation renters and you can expect to bring in up to $1500/week during the high season. Enjoy the privacy and convenience of your own home while you are in Playa and rent it out while you are away!